How To Register Friends On Nintendo Switch - You can become friends with other Nintendo Switch users. Once you've become friends with someone, you can check each other's online status and play games together. In order to use this feature, your user must be linked to a Nintendo Account. Select the user icon (user page) on the HOME Menu, then select "Add Friend". There are two ways to become friends with someone: send them a friend request that they accept, or accept a friend request that they've sent to you. Either method requires an internet connection. 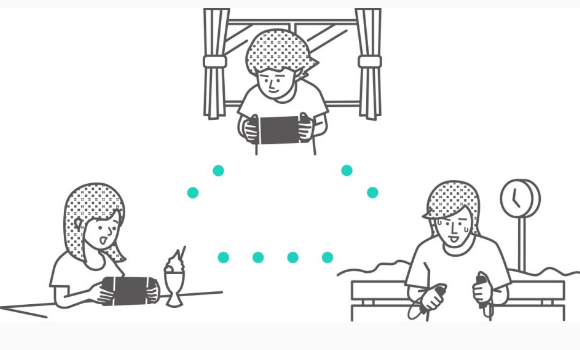 You can send friend requests to nearby people with Nintendo Switch consoles. Select "Search for Local Users" and follow the on-screen instructions. 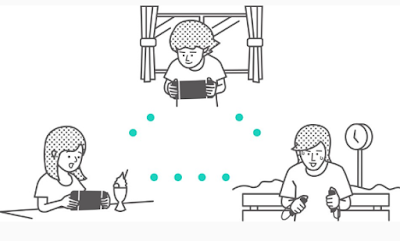 If your console is not connected to the internet, your friend request will be saved temporarily and will be sent automatically the next time you connect to the internet. You can send friend requests to users you've played with online. Select "Search for Users You've Played With", then select the user you'd like to become friends with and send them a friend request. A friend code is a number that is issued to each user once they have linked to a Nintendo Account. Have the person you'd like to become friends with tell you their friend code. 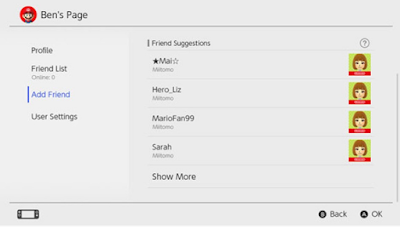 Then select "Search with Friend Code" and send them a friend request. You can check your friend code on the "Profile" screen. You can also check your friend code from User Settings ⇒ Friend Settings. If your Nintendo Account is also linked to apps like Miitomo, users who you're friends with on those apps will be displayed and can easily be added as friends on Nintendo Switch. If you don't want suggested friends to be displayed, visit the Nintendo Account website via a smart device or PC and select "Friend Suggestions" to change your settings. You can check a friend's online status from Friend List in your user page. Each user can register up to 300 friends. Select a friend to display more detailed information about that user. Making someone a best friend will send them to the top of your friend list. You can also select "Options" to delete a user or add them to your blocked-user list. You will not receive friend requests sent to you by blocked users, and you will be unlikely to encounter those users online (excluding some games and game modes). You can block users from your friend list or by selecting Add Friend ⇒ Search for Users You've Played With. Blocked users will not be notified that you have blocked them. You can check your blocked-user list and unblock users from User Settings ⇒ Manage Blocked-User List in your user page.